ADJ will continue to celebrate 30 Years of Pure Lighting Excitement as it returns to LDI with a series of game-changing products, all of which display the company’s recent developments in the professional production and nightclub/mobile entertainment sectors. 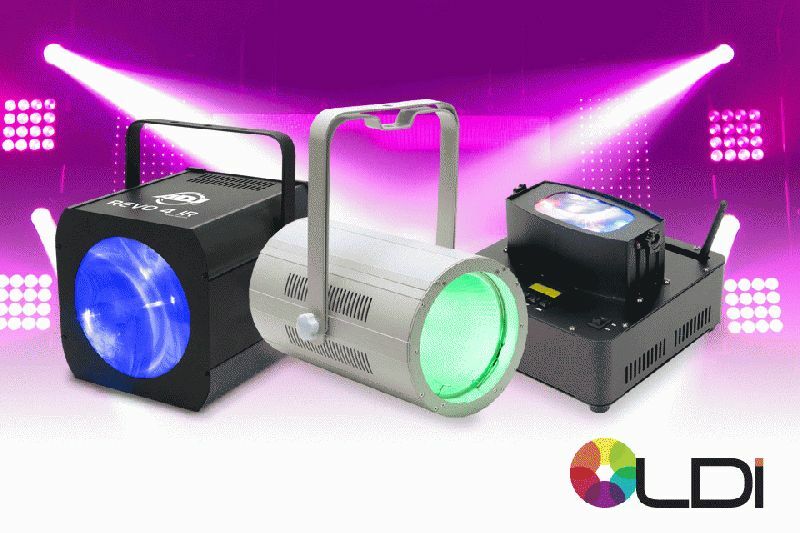 LDI 2015, which runs from October 23-25, 2015 at the Las Vegas Convention Center, will see ADJ showcase over a dozen exciting new products. Bringing pure lighting excitement to ADJ’s expansive and action-packed stand (booth #1317), visitors will be able to experience a range of new products first-hand, including the WiFLY Chameleon, Revo 4 IR and COB Cannon Wash Pearl. One of the stars of ADJ’s LDI show will no doubt be the WiFLY Chameleon, a compact effect unit that utilizes three 15W RGBA+UV (5-IN-1) LEDs, 63 built-in colors and a variable beam angle to create one-of-a-kind tri-beam effects in an array of off-set colors from one lens. Thanks to its rechargeable lithium battery and built-in extended-range WiFLY DMX, the effect can also be positioned away from power outlets and controlled from a distance of up to 2,500ft, allowing users to go completely wireless. Furthermore, for truly tailored effects that can add something truly special to any venue, roller rink or mobile lightshow, the WiFLY Chameleon offers users individual pixel control. With the built-in battery and WiFLY wireless DMX users have a lot of creative control of the WiFLY Chameleon and are not limited to wired power or DMX control. Plus, with a variety of WiFLY Controllers, the options for operation have never been better. Also on show at LDI will be the Revo 4 IR, a moonflower effect that utilizes 256 LEDs and a concise beam angle to generate a series of razor-sharp red, green, blue and white beams that project eye-catching patterns onto the wall and bring atmosphere to the dance-floor, whether with or without fog. Thanks to its budget-conscious price and far-reaching effects, the Revo 4 IR is ideal for use in nightclubs, roller rinks and mobile setups, while the in-built IR technology means users can control the effect from afar using the UC IR remote or the brand new Airstream IR control app for hand-held devices. Dazzling crowds not only with its unbelievably immersive wash effects but with its sleek off-white all metal exterior, the COB Cannon Wash Pearl, will feature prominently on the ADJ stand. Fitted with a high-power quad-color (RGBA) 150W COB (Chip On Board) LED and offering a huge 80-degree beam angle (variable thanks to the included replaceable 40-degree and 50-degree lenses), the COB Cannon Wash Pearl lets users create ultra-wide washes in a range of smoothly-mixed vivid colors while being versatile enough to create narrower effects too. Additional features include 3-pin and 5-pin DMX In/Out and PowerCon In/Out. Aside from these brand new lighting fixtures, a wide range of recently launched products will also be on display, giving visitors a unique opportunity to see many of ADJ’s leading effects in action in one place, from the game-changing AV6 video panel to the powerful Vizi Beam 5RX to the super-versatile fixtures in the WiFLY EXR range. These innovative new effects will be showcased in a series of stunning specially-programed lightshows that will run throughout the three days of LDI. ADJ will also be involved in the PRODJ@LDI education program during LDI 2015. ADJ has enlisted Arnoldo, of Premier Entertainment of Lakeland, Florida to teach two seminar on DMX training. The first seminar is on basic DMX on Tuesday, October 20th from 1:30 - 2:30pm at LDI. The second seminar on Advanced DMX for Mobile DJs will be from 11:00am -12:30pm on Wednesday, October 21st.